Sensorial – Montessori materials and teacher extensions help students explore the physical world, focusing on subtle variations. Each exercise has a built-in control of error and is just difficult enough to represent a meaningful challenge. 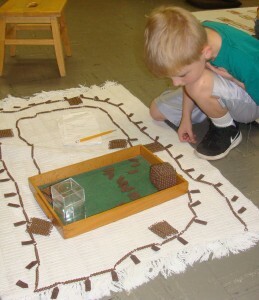 Practical Life – In a very real sense, Montessori children are responsible for their environment. At the primary level, they learn to sweep, dust, polish mirrors, and clean windows; they set tables and clean up spills, learning how to maintain their surroundings. These activities help to develop self-confidence and independence, giving them an inner sense of order and focus. Language – Montessori materials and phonics-based activities help students develop a strong understanding of our language. Throughout the program, students are challenged at their level to explore writing, reading, and word properties. Mathematics – Using Montessori materials, the children begin working at a manipulative level, understanding the relationship between quantity and symbol. Cultural – Our program is rich in materials and topics, as students delve into geography, science, history, and cosmology. Starting at a young age, the students use puzzles and manipulatives to understand the world around them. As they get older, the underlying concepts are developed and students begin their own research, developing research and study habits that will allow them to move quickly in their future learning. Music and Physical Education – Both of these topics are addressed within the classroom at the primary level and as supplementary courses. Our approach is non-competitive and focuses on the development of skills that can be further used in extra-curricular activities.